Yala National Park is situated on the south coast of Sri Lanka, with parts of the park reaching to the water and touching the Indian Ocean. Unlike safaris of Africa, Yala is still relatively undiscovered and catching up to its African counterparts in many ways. But one thing that it can certainly compete on is the wildlife! 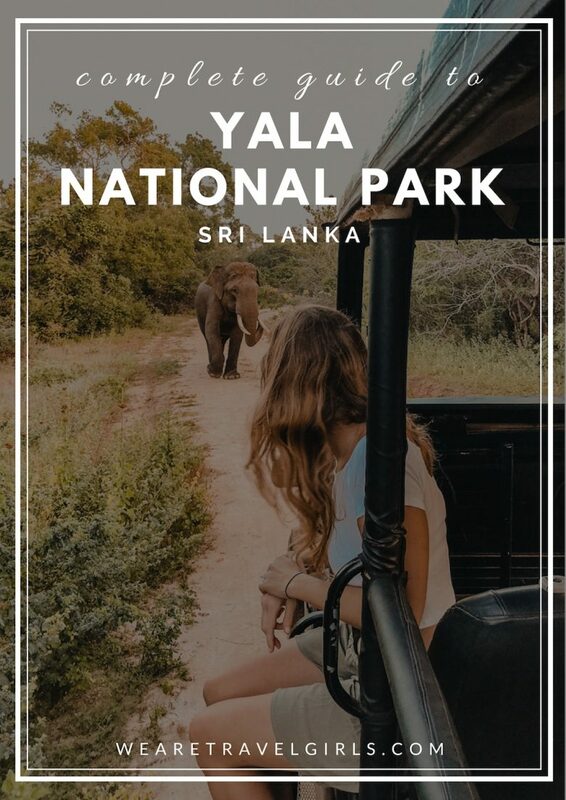 In this guide I share information about the park, the animals you can expect to see, when and how to visit and other tips to make you experience at Yala National Park amazing! Yala is divided into 5 zones. The two zones that are open to public and tourists are zone 1 and zone 5. The other zones are reserved only for professional research and documentary filming. This allows for a large proportion of the park to remain a natural habitat for the animals without the intrusion of safari jeeps. Depending on how many drives you do, you will likely spend the majority of your drives in zone 1 where there are more sightings of animals since this part of the park has been open longest and the animals are more accustomed to the sound of the vehicles. In zone 1 you will find that the bush reaches right up to the trails, so you will have limited views into the animals habitat and have to get lucky that the animals are in the road or beside the road in many areas of the park. In zone 5 you will have broader landscape views, so it is definitely worth at least one visit. Certain parts of this zone have winding trails with a tree canopy over and mossy forests that touch the sides of the trail. The only way to describe this part of the park was like a scene from Lord of The Rings and we were so glad to experience it. We also got lucky and saw a herd of breeding female elephants with two babies in zone 5! 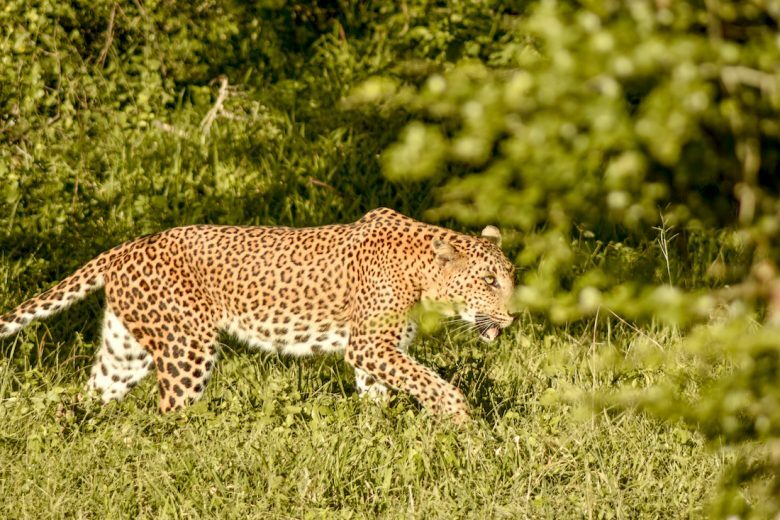 Yala National Park is particularly popular as it offers the chance to see one of the most beautiful big cats, the leopard. Many visitors to Sri Lanka will choose Yala as they not only want to see elephants, birds, buffalo etc, but they really want to see one of these majestic cats in the wild! You can visit the park year-round and our guides told us it doesn’t matter when you visit since animal sightings happen throughout the year. 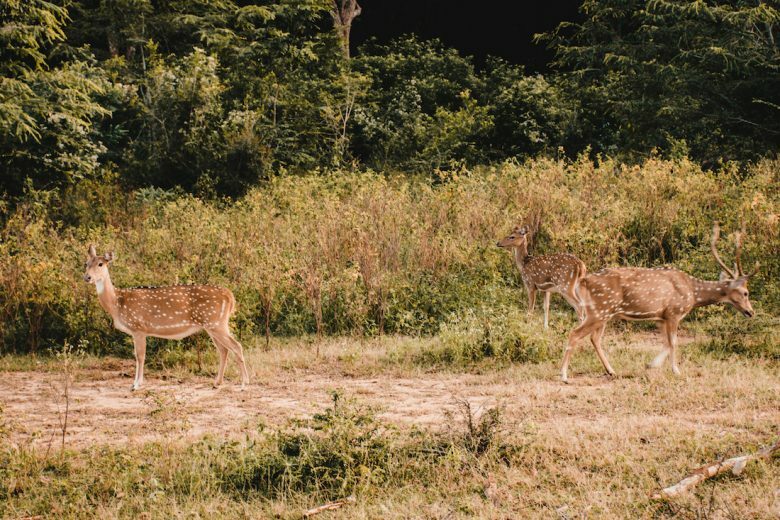 We visited in February which is considered high season, but this time of year offers a pleasant climate across Sri Lanka, less rain and plenty of opportunities to spot some wildlife! Absolutely yes, you need a guide! There are currently no regulations requiring a guide for the safari, so many people will opt to only hire a driver. 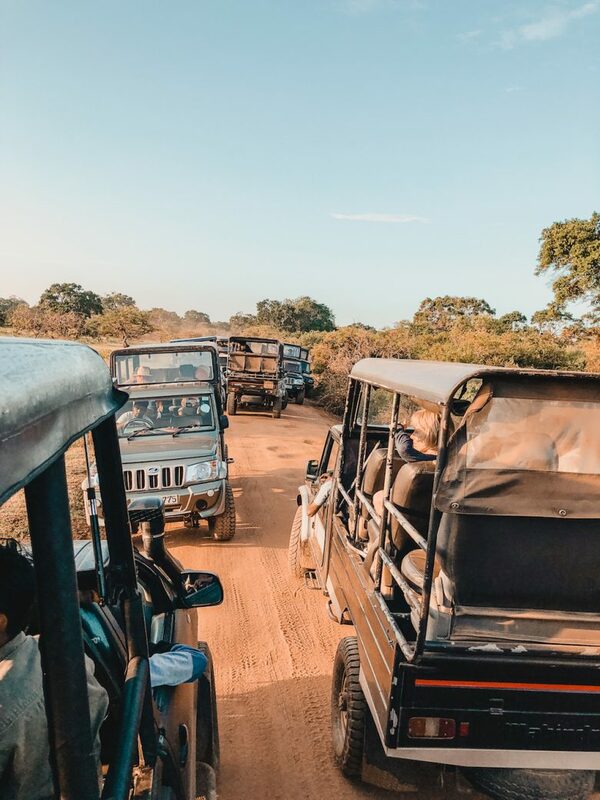 However, whilst the driver of course provides the transport around the park, they often speak little English and do not have the experience and knowledge that a guide can offer you. We booked our safari with Leopard Trails, staying at their luxury tented camp and included a guide, Dhanula, for our entire stay. This is invaluable for you to both learn about the park and its inhabitants, and to have the highest chance of spotting the animals you want to see. A good guide will know which locations are most likely for sightings in addition to avoiding big tourist crowds. We were able to ask lots of questions throughout the safari and really get to understand the animals behaviour and more about the park itself. WHAT ANIMALS WILL I SEE IN YALA? As with any safari there is no guarantee of the animals that you will see in the park. However, it is pretty likely that you will see many different species of birds, including crested serpent eagles and peacocks, lots of spotted deer, buffalo, monitor lizards and wild boar. The more difficult sightings are of elephants, crocodile and of course leopards. There are around 10-15 tusked elephants in zone 1, so seeing one of them is rare but not impossible – we were fortunate to see two tusked elephants. One of them was the famous male tusked elephants Gamanu who once ate a tourist’s handbag, passport and all! We also saw other young males, and a herd of breeding females in Zone 5 with two babies. WHAT ARE THE CHANCES OF SEEING A LEOPARD IN YALA? 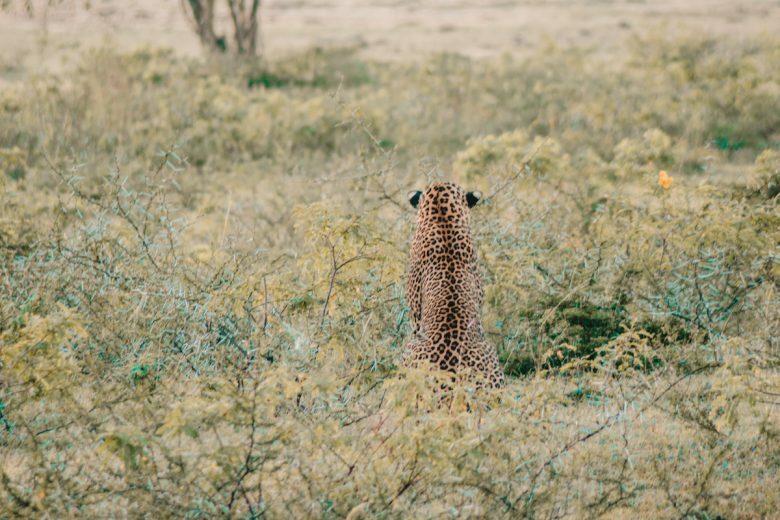 There are estimated to be around 75 leopards in zone 1, the zone is 144 square kilometers so the ratio is around 1:2 meaning there is a good chance you may see one. However, the guides told us they can see them every day for a month and then not see one for several days. It really up to chance and if you are a minute later you may miss a sighting. On our very last drive as we were leaving the park, my husband pointed out a peacock displaying its feathers, so we slowed down to view the peacock and the jeep behind drove past us. 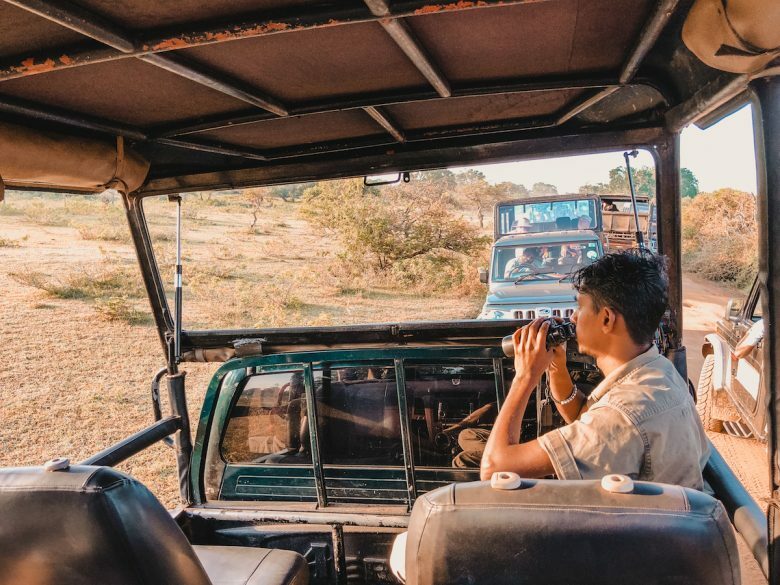 That jeep had two other guests from Leopard Trails and when we returned to camp, they showed us the photos of an incredible sighting of a leopard in the road! If we had kept driving instead of viewing the peacock we would have had a leopard sighting all to ourselves (a fact I don’t let my husband forget), which goes to show the random nature of leopard sightings. 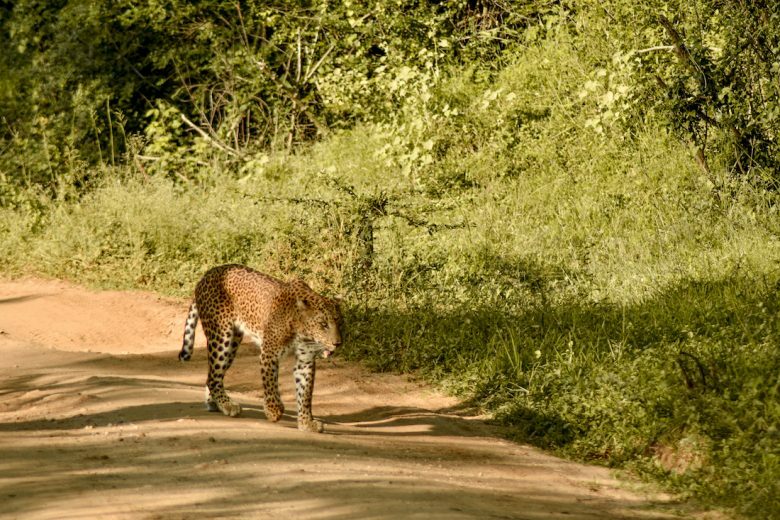 During our time at Yala National Park we saw a leopard on our first drive and were lucky enough for him to walk right out into the trail ahead of us, walk up towards our jeep before going into the forest. We also had the incredible luck to see a live kill on our last drive. The guides had not seen a live kill for over 18 months and it is incredibly rare to see. We saw the leopard cross the road and watched her stalk the prey for over an hour before finally making the jump and capturing a young buffalo and taking it up a nearby tree. HOW MANY DAYS SHOULD I SPEND AT YALA NATIONAL PARK? We spent two nights at the Leopard Trails camp, which gave us the opportunity to go on four safaris. Some guests just do one night or even three nights if you really want to maximise your chances of seeing the animals. On the first day we arrived around midday, had lunch then went on our first safari around 3pm. The following day we left for the morning safari at 5am and got back to camp at 9.30am for breakfast. The afternoon safari that day was at 3pm again, and then our final morning safari at 5am. I would recommend at least two nights so that you can really have the time to enjoy the park and also to make sure you have maximum chance to spot the leopard! This may seem like an odd question, but I wanted to make a note about the wake up times and when you get going on your safaris. You will probably wake up around 4.30am and aim to leave around 5am (depending on where you are staying). The park opens at 6am and the goal is to be first in line at the gate. On our first morning drive there was a large group of jeeps ahead of us, so we didn’t really understand why the guides wanted to be first in. On the second morning, when we were first in line and the first car into the park we quickly realised why it was so important to get in first! As you enter the park, many of the animals are still just waking up and are sitting or walking on the trails that the cars drove along. The first thing we saw was a huge crocodile stalking up the road, as we approached we had a great view before it disappeared off into the undergrowth. So of course the cars behind would miss this. Pretty soon after we came across a young male elephant by the side of the road. So I can tell you, listen to the guides, get up early and make sure you are first in! WHY NOT JUST GO TO PINNAWALA? 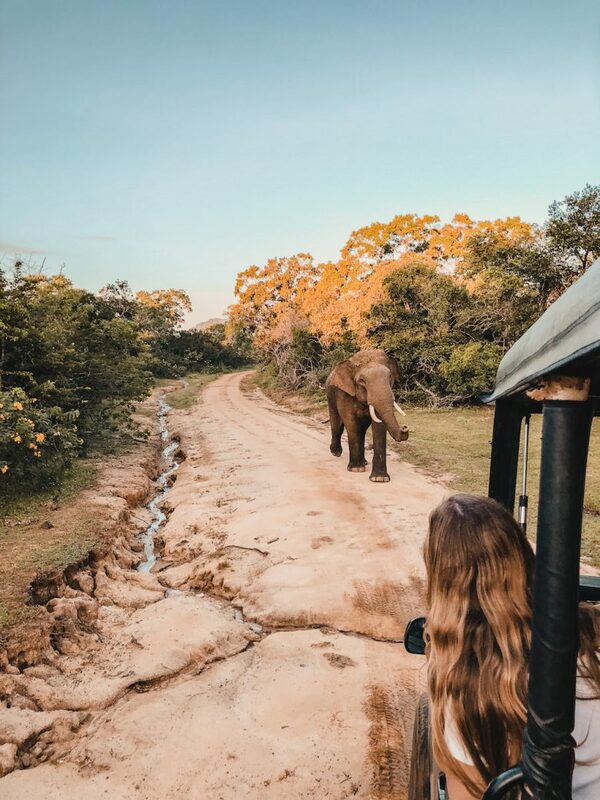 Pinnawala elephant orphanage has enjoyed recent fame from its prevalence on Instagram, with many of your favourite bloggers and social media stars heading to this part of Sri Lanka to have their photos in front of the many elephants here. Whilst I have not been to Pinnawala (through conscious choice not to support this organisation), I cannot encourage you enough to instead go to a park like Yala National Park where you see the elephants in their natural habitat. Yes, it is true that Pinnawala is an orphanage and does some good in rescuing elephants in Sri Lanka. However, it has now started to breed the elephants for captivity and it does not release them back to the wild. 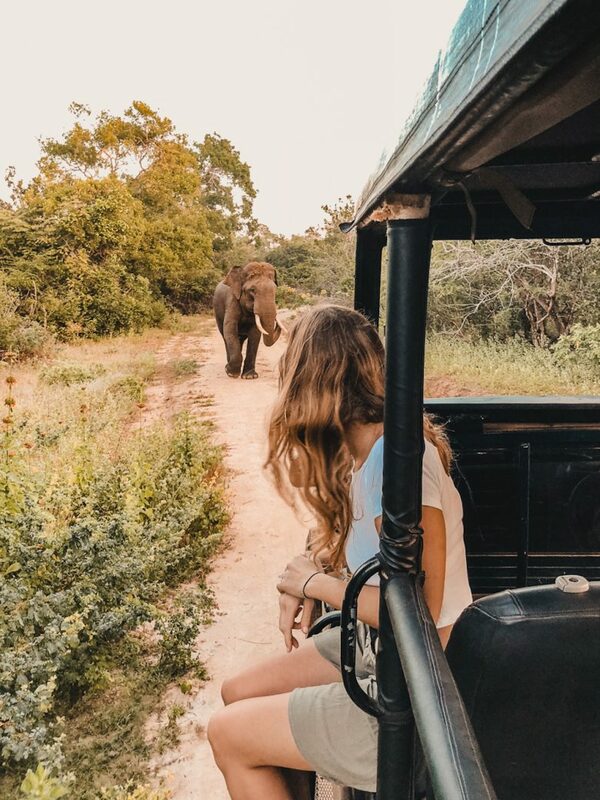 We have also heard stories that whilst the elephants look like they are bathing and having fun on the rocks over the water they are actually chained to these positions – so that tourists can achieve their perfect selfie. Please don’t be that person. 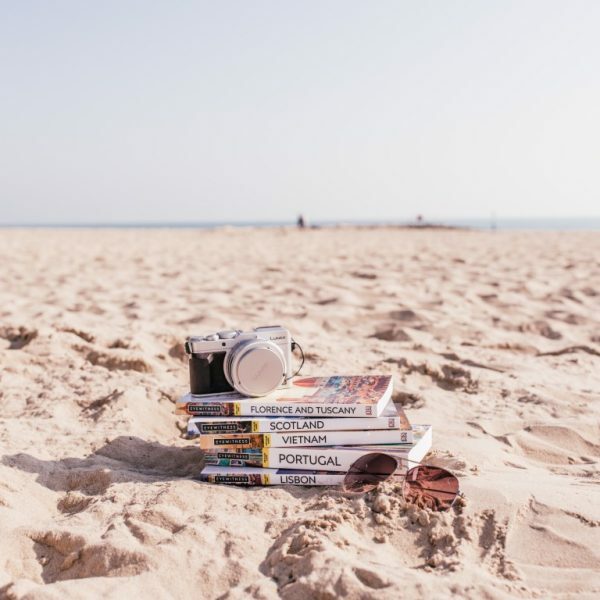 If you would like to read more please see information on Born Free and also this article by Hand Luggage Only gives a personal experience of a visit to Pinnawala. If you wish to go to an elephant orphanage, our guide recommended Elephant Transit Home Udawalawa where the elephants are rescued and reintroduced back to the wild. 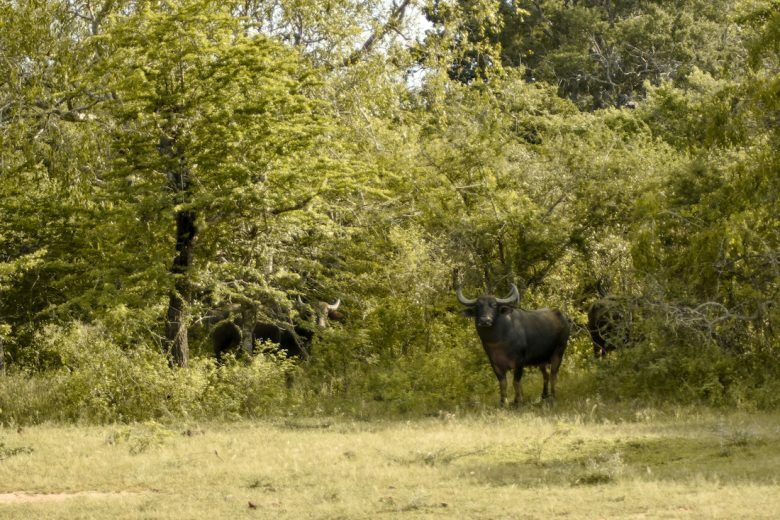 Or I would highly suggest sticking to the national parks Yala National Park, Minneriya National Park and Udawalawe National Park to see these animals in their natural habitat. 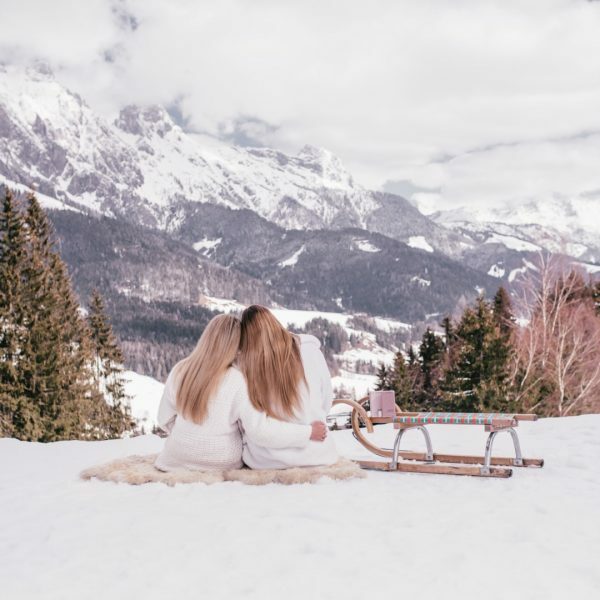 We chose a luxury camp Leopard Trails and I cannot recommend them highly enough. 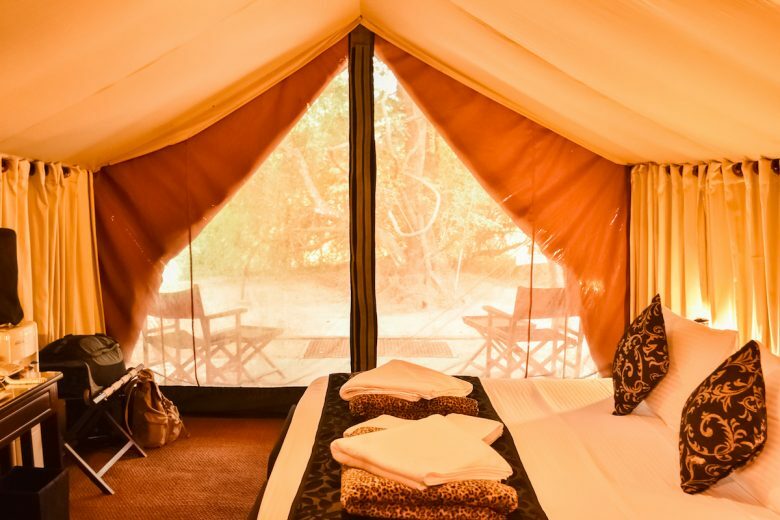 Leopard Trails has 8 luxury tents, complete with full bathroom, outdoor shower, a comfy double bed and air conditioning. It was better than a hotel room! At Leopard Trails you get the full package of all your meals, alcohol and guides. At the end of a day out on safari we got to sit by candlelight and enjoy a glass of wine with the other guests looking up at the stars, before having a delicious dinner. The camp is so pretty in the evening, the walking paths and dining tables are lit by lanterns, it really is a special experience! The other thing that I loved about Leopard Trails was the guides. 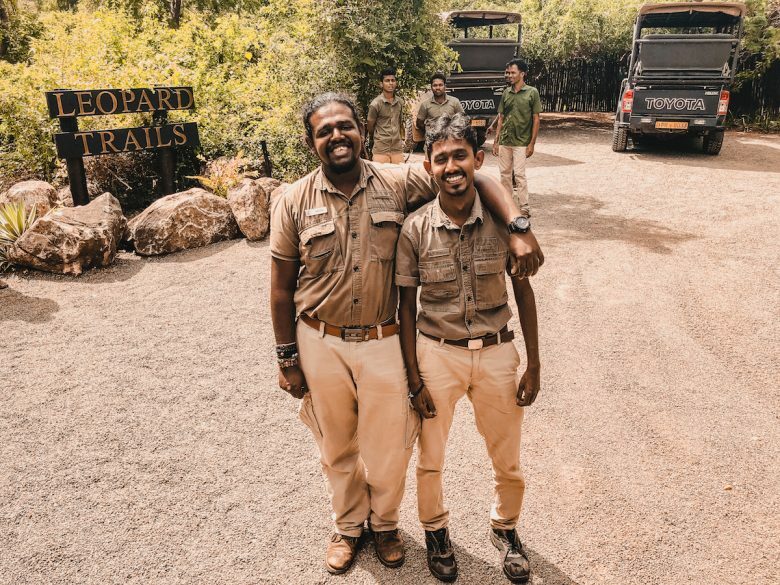 We had a dedicated guide everyday who took us out on safari, as I mentioned earlier having a guide is such an important part of the safari and having Dhanula with us made all the difference. Invest in a good camera. A Yala National Park safari is a once in a lifetime experience and you will want to capture it. Leopard Trails actually rents camera equipment, so if you don’t want to splash out on a fancy new lens look into a rental option in advance. Bring sunscreen. The jeeps are covered but the sun shines in, so make sure to use sunscreen and / or cover up. Bring a sweater to wear in the morning when you leave as it’s cold before the sun comes up. Don’t drink too much before you drive. There are no toilets in the park and only a few places to legally stop for a dash into the bushes. Don’t set your expectations too high. Every safari experience is different and even if you don’t see the animals you are hoping for the drives are wonderful anyway. Safari etiquette is to not tell new guests all the amazing things you saw on your drive. They may not be as lucky and you don’t want them to be disappointed. 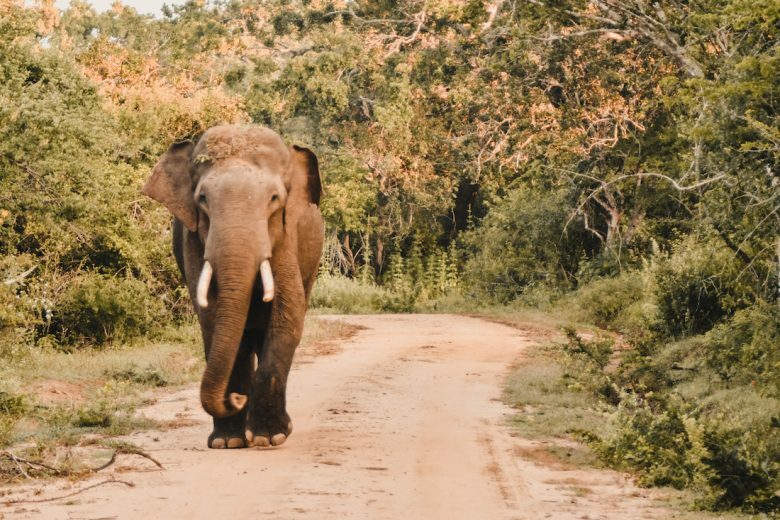 Overall you will not be disappointed with your visit to Yala National Park and I recommend you make sure to add this to your Sri Lanka itinerary. 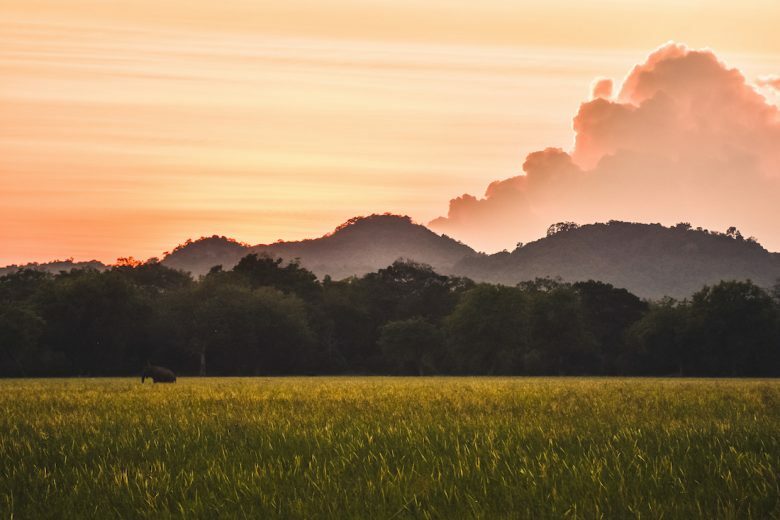 We hope that this article has inspired you to visit Yala National Park. If you have any questions about Sri Lanka or have your own travel tips to share please leave these in the comments below. Thanks for the informative article! We (https://wemarriedadventure.com) will be visiting Sri Lanka in December of 2018 as part of our trip around the world. I had originally planned to be in the country for only a few days, but it looks like I’m going to have to extend it visit to Yala. Thanks again! Well this sure beats the animal safari at Animal Kingdom haha! 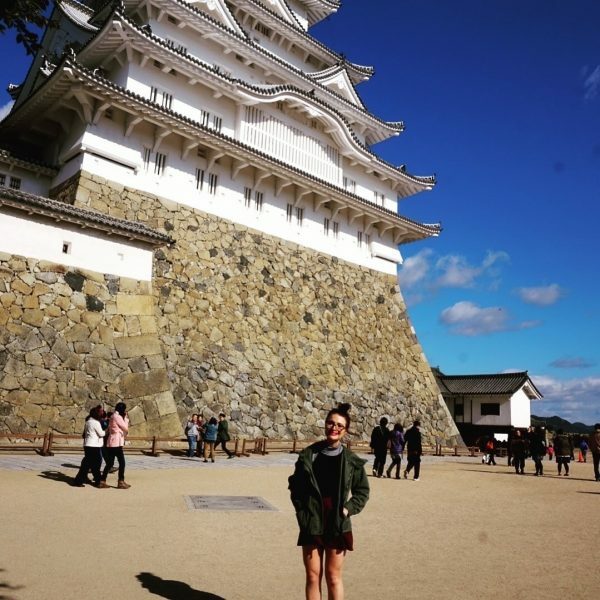 I loved all your photos, and thank you for sharing insights on Pinnawala. It’s so sad how elephants are continually exploited for money. Really hope to make it to Sri Lanka soon! Incredible! We are coming here in two weeks, thank you for all the tips. What lens are you shooting with for the photos in this blog post?